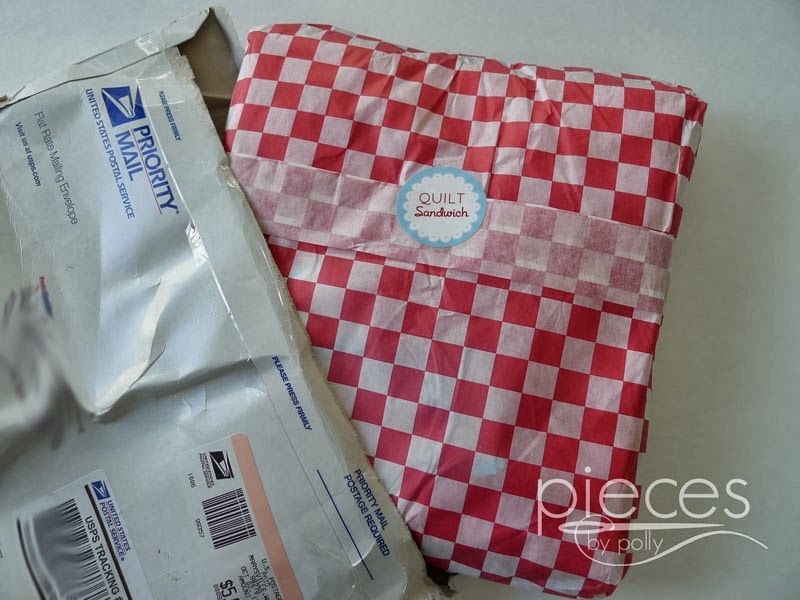 And check out this package from my new sponsor, Quilt Sandwich. 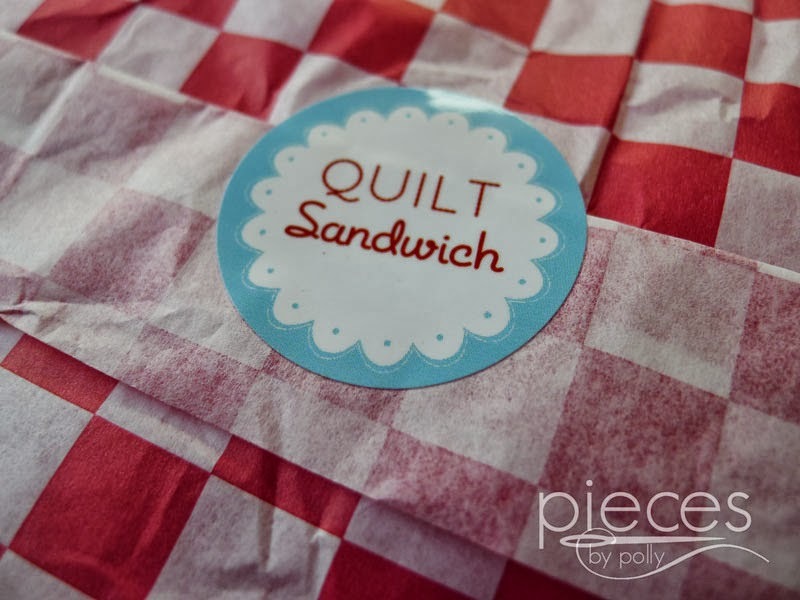 I first found Quilt Sandwich on Etsy and ordered from them in January when I was collecting the boy Children at Play fabrics. Their shop has been steadily getting bigger and they've moved into their own website. I'll give them a proper introduction soon, but I just had to show off what they sent me now. 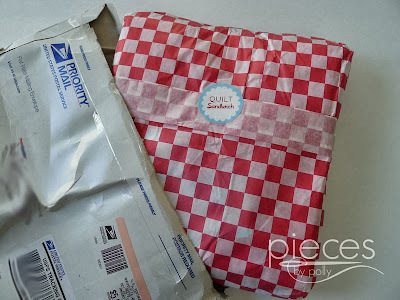 Their packages make quite the impression because when you open them, your fabric is wrapped up like a sandwich. ...but of course there was fabric inside just waiting to burst out. I've been promising my niece that I would make her a "Big Girl Polka Blankie" soon. You see I made her some very bright multi-colored polka dotted burp cloths as a baby. She spit up a LOT, so I made her a LOT of them out of them. She still loves all things polka dot. (You might remember her polka dot birthday cake here.) Anyway, she somehow got attached to them as a comfort item...and now that she's 7, there are only two left, so she needs a big-girl polka blankie. So I was searching some of my favorite fabric shops for some fun polka dot fabric...and hit the jackpot at Quilt Sandwich with that pink fabric with multi-colored polka dots. 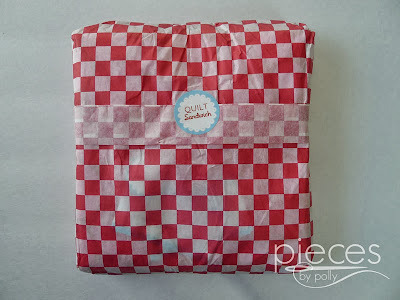 It's the closest print I've found anywhere to the "real" polka blankie fabric. (Which sadly, it looks like they've sent me the last piece, but they have a similar print with a white background here and one with a black background here. 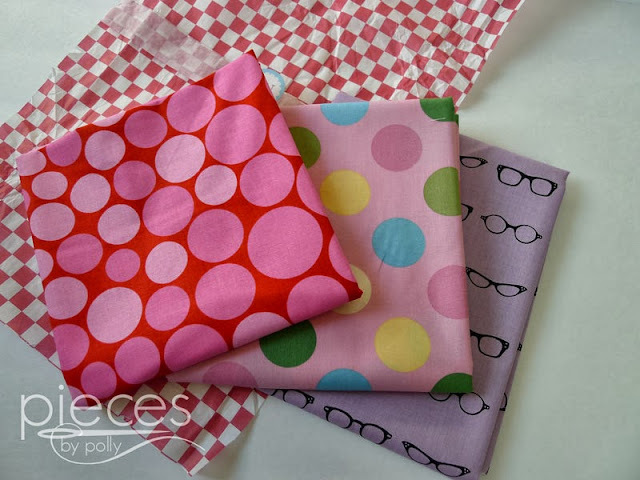 And the Hoopla Red and Pink Dots fabric from Moda? Well it has a really cool almost ombre polka dot affect to it...big polka dots on one side that gradually decrease in size until they're tiny pink polka dots on the other side of the fabric...so many fun options. Anyway, you'll get to hear more about Quilt Sandwich soon when I show some of my favorites from their shop...or if you want a sneak peak, you can check out my Fabric board on Pinterest. And speaking of squishy mail, I also received these cute little booties in the mail this week from Paula at Sewy Stuff. 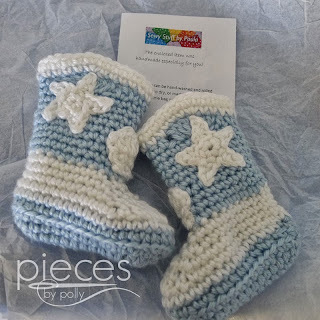 She's not a sponsor, but her little shop is one of the best kept secrets on Etsy. Once she's discovered I'm sure her prices will go up. These are destined to be turned into some Christmas ornaments and they were only $8.50 for the pair with the sale she has on right now. Paula has blue and pink ones in stock. Hey Polly, thanks for the shout out!! 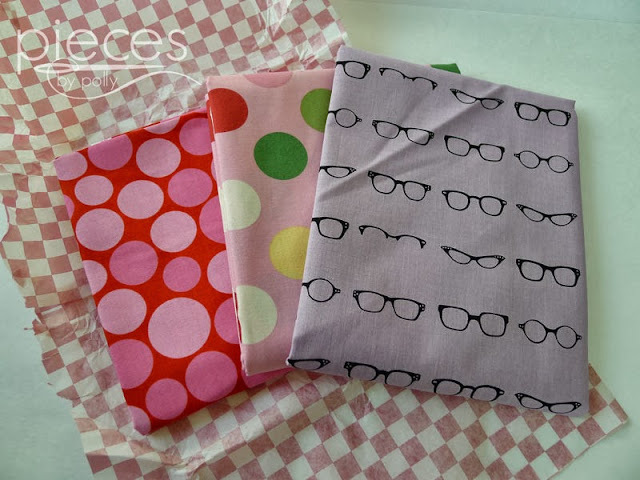 I keep eyeing (no pun intended) that eyeglass fabric myself. I have no idea what I'd do with it, but it's so doggone cute! 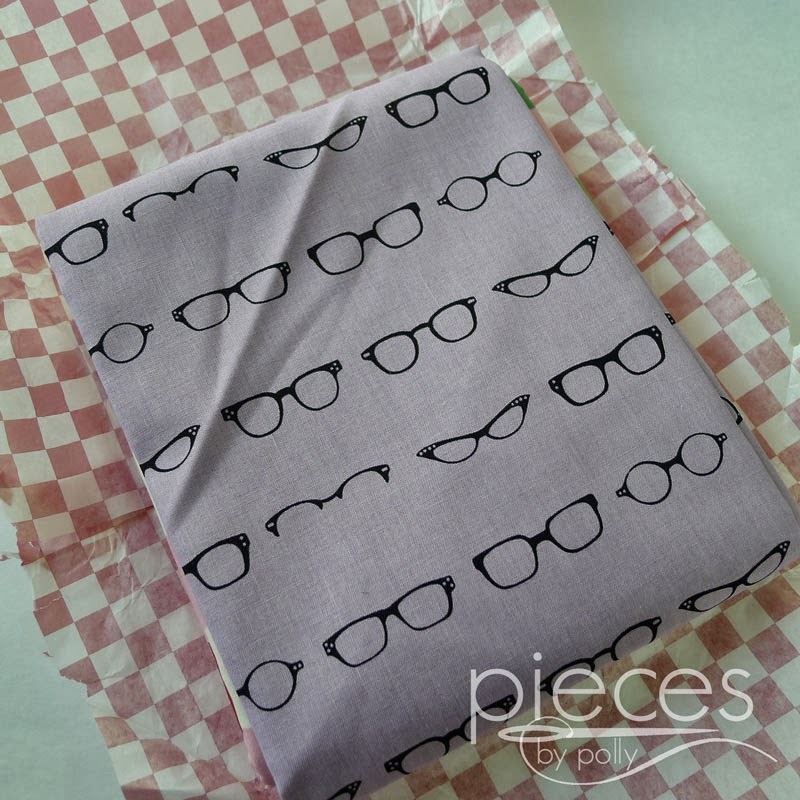 Haha, I still have a sticky note on the wall down in my sewing room reminding me to send you a square of that glasses fabric from when I bought it earlier this year. Whoops. Guess this is what I get for waiting so long. Way to be the favorite auntie! 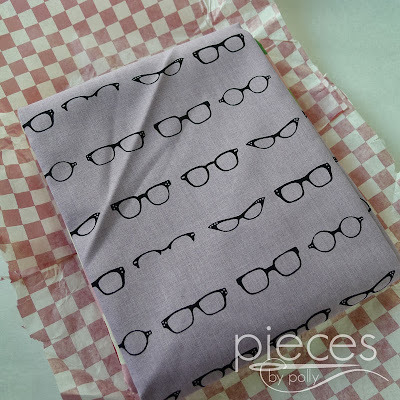 Love the eyeglasses - have worn several of those styles over the years! Dots are hot - we just got another group in. And today three cases of new fabrics - but nothing is coming out until we get cleaned up from two weekends of quilts shows.